We’re back with another installment of Pass the Cook Book Club, and as much as I loved last month’s recipes, this month’s may have been even better! I jumped back into the group fray a few months ago joining this club, and have been loving it. You can read more about the group here, but the basic idea is that each month Kita, our fearless leader, selects three recipes from one of the cookbooks on her shelf and then everyone in the group makes and posts about one of them. This month’s selection was The Smitten Kitchen Cookbook by Deb Perelman. You guys know Deb, right? She runs the wildly successful Smitten Kitchen blog. It’s long been a favorite of mine, not only for the great recipes, but in large part because I think her writing is so wonderful. The three recipes selected this month were cheddar swirl breakfast buns, these tomato scallion shortcakes, and a s’mores layer cake. In past months I’ve struggled with choosing just one, but this time it was pretty easy. I’d actually already previously made the cheddar swirl breakfast buns, and spoiler alert, they’re awesome so put them on your to-do list! You guys know I love a good dessert, so the s’mores layer cake was tempting, but since it’s just two of us here, I really need an occasion or excuse to make a layer cake and just didn’t have one. Tomato scallion shortcakes it was! 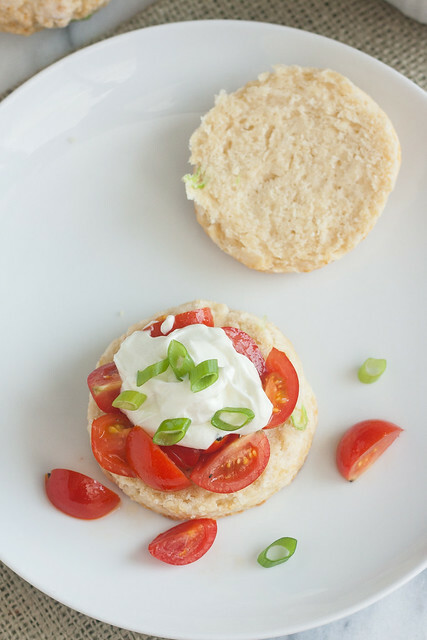 If you’ve ever made strawberry shortcake, think of these tomato scallion shortcakes as a savory twist on the same idea. The biscuit is unsweetened and includes green scallions for extra flavor. Instead of a strawberry topping, we’re using a simple tomato salad here. And finally, a savory whipped goat cheese is the finishing touch. The simplicity of this recipe really allows the ingredients to shine. I think fresh summer tomatoes are a must here – the often bland grocery store options just wouldn’t do the dish justice. I’ve only had goat cheese a few times and find its tanginess a little aggressive, but it worked here. Texturally the topping was just like whipped cream too – so light and fluffy! 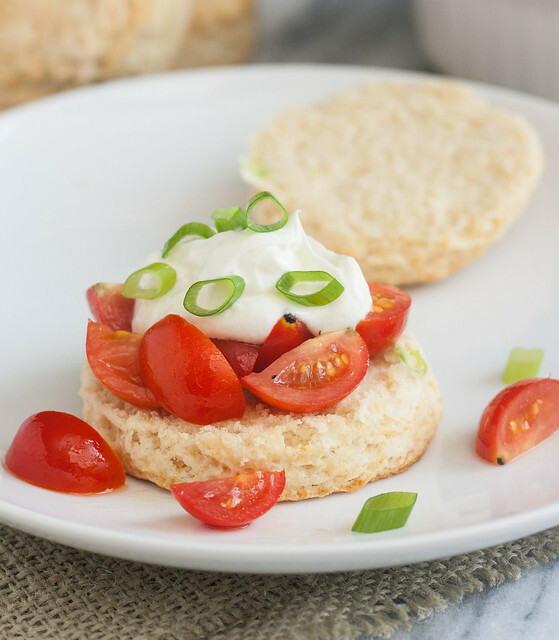 These tomato scallion shortcakes make a wonderful lunch – in fact, the day I made the recipe I delivered the components to my mom at her office so she could enjoy the shortcakes too. I’m already itching to make them again – just waiting on my tomato plant to produce enough fruit to make it happen! Want to join the club and cook with us? Kita has more info in this post, and you can check out the club’s Facebook group here. In a large bowl, whisk together the flour, baking powder, and salt. Add the add and use a pastry cutter to cut in the butter until the pieces are no larger than small peas – the mixture should look like coarse meal. Mix in the scallion, and then add the milk, stirring just until a rough dough comes together. Turn the dough out onto a lightly floured work surface. Gently pat the dough out to 3/4-inch thickness and using a 3-inch round cutter, cut biscuits from the dough (don’t twist the cutter, use a straight up and straight down motion). Transfer to the prepared baking sheet, leaving about 2 inches of space between them. Gather the scraps and cut more biscuits until you have 6-8 biscuits. Bake the biscuits for about 14-15 minutes, or until they has risen and are golden brown. Remove to a wire rack and set aside while you make the remaining components. To make the tomato salad: Whisk the oil, vinegar, salt, sugar, and pepper together until well combined. Add the tomatoes and gently toss until they are coated in the dressing. To make the whipped goat cheese: Add the heavy cream to a medium bowl, and use a whisk (you could do it with a hand mixer) to whip the cream vigorously until soft peaks form. Add the softened goat cheese and continue whisking until the mixture is light and fluffy. To assemble: Split the biscuits in half. Top each of the bottom halves with some of the tomato salad and then a dollop of the whipped goat cheese. Garnish with scallions. Serve immediately. 17 Responses to "Tomato Scallion Shortcakes with Whipped Goat Cheese"
So simple and tasty looking! Love this! I opted away from the cake to since there is just two of us. The cheddar buns were amazing but now so are your photos. Will have to try this recipe out too. I love the Smitten Kitchen cookbook! These have been calling my name for weeks, but I still have not made them! You just sold me! Your looks gorgeous and I am so excited to give them a try! Whipped goat cheese is genius. These sound incredible, Tracey! I opted not for the cake as well because I just didn’t have the time to dedicate to it, even though it looked awesome. Loved the idea of these savory shortcakes. I wanted to make this recipe too but couldnt do it this month. Home grown tomatoes are the best. Gorgeous with the bright red tomatoes! These was pretty tempting to me too! I went back and forth between the cake and the cheddar buns, but now I am thinking I should have given more consideration to these shortcakes. Your pictures look great, as always Tracey! So far it looks as if we’re the only two who did the tomato shortcakes. We loved it! Happy we weren’t the only ones. We’re lucky that my husband’s aunt and uncle live next door to us and possess the most amazing garden. Like most people with a garden, they are happy to share so we’ve been eating fresh cherry tomatoes by the pound. There’s nothing better! I love this recipe as a unique way to celebrate their deliciousness. Love this-looks so fresh and tasty and incredible! Smitten Kitchen is a regular for me, I always find her writing to pull me in. I hve never had whipped goat cheese before, sounds delicious. So so delicious looking! And I am glad you used your fresh tomatoes. Mine are still green and I can’t wait for them to ripen already. 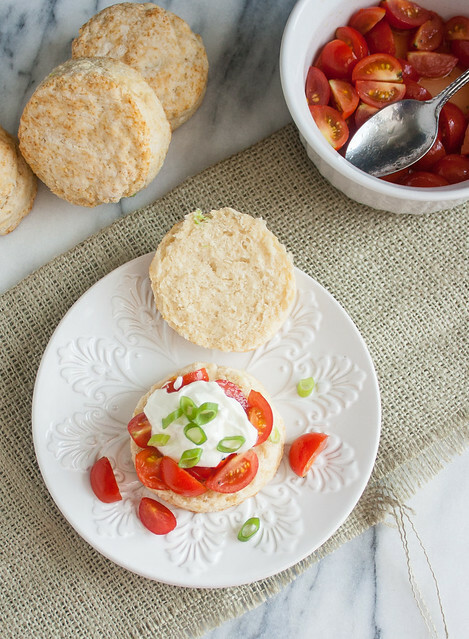 Your version of the tomato scallion shortcakes is so lovely. I could go for a big plate of that right now!! These are definitely my favorite things I’ve made from Deb’s book so far!! the s’mores cake does sound incredible, but i love this savory take on shortcakes! 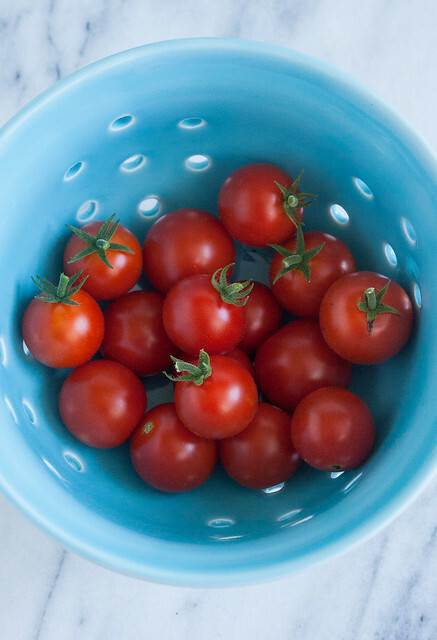 There is nothing like fresh tomatoes. I bet it added so much flavor to your shortcakes. I really enjoyed the tomato goat cheese combination.